October sees the launch of SFEDI Awards’ digital badging trial. From 1st October those who hold or achieve a qualification from our Business and Enterprise Support suite will be issued a digital badge. These are issued in addition to standard certificates and can be displayed by learners on websites and social media. From the Boy and Girl Scouts, to PADI diving instruction, to the more recently popular fitness-tracking apps, badges have been successfully used to set goals, motivate behaviours, represent achievements and communicate success in many contexts. A “digital badge” is an online record of achievements, tracking the recipient’s successes and demonstrating the work completed to get it. As a simple definition, a digital badge is an online validation of an achievement, skill or credential. The badge itself is a visual/digital image which a learner can display to represent knowledge or skills acquired and anyone who clicks on it can link to verifiable information about who issued the badge and the learning evidence required to achieve it. Digital badges are data rich in ways that paper-based certificates and resumes or PDF transcripts can’t be. So, at one end of the spectrum, digital badges act like online gold star stickers used to reward and motivate, and at the other end of the spectrum, they house rich learner and institutional data used to identify skill sets, competencies or qualifications. Digital badging has developed slowly over the past decade but by technology adoption standards, we appear to be on the verge of a digital badging vertical trajectory in terms of employers and employees uptake. By launching our beta trial, SFEDI Awards is travelling alongside this vertical so that the rate of change outside does not surpass our rate of change and adoption inside. Nic Preston, SFEDI Director of Quality, said, “This is a new step forward for SFEDI Awards and continues on the exciting new services within quality assurance and validation we have been and will continue to provide in collaboration with our centre network and the wider enterprising community. 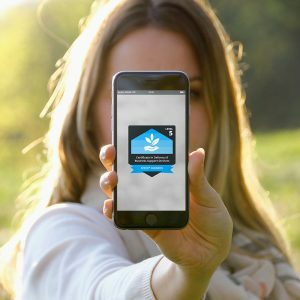 “The launch of our digital badge trial helps our learners to be proud of and promote their achievements in many different electronic forms and also provide assurance to the wider community of the level of learning and achievement they have gone through to be able to undertake and complete a SFEDI Awards qualification.